Kutaiba al-Azrak is a citizen of the Kingdom of Caid, who recently went to Estrella War, where she was integral in the organization and running of fighter support on the battlefield, especially on Saturday. Their Majesties asked me, as Crescent Principal Herald, how they might recognize Lady Kutaiba for her efforts. After some discussion, it was decided that she should receive a Royal Recognition of Excellence. 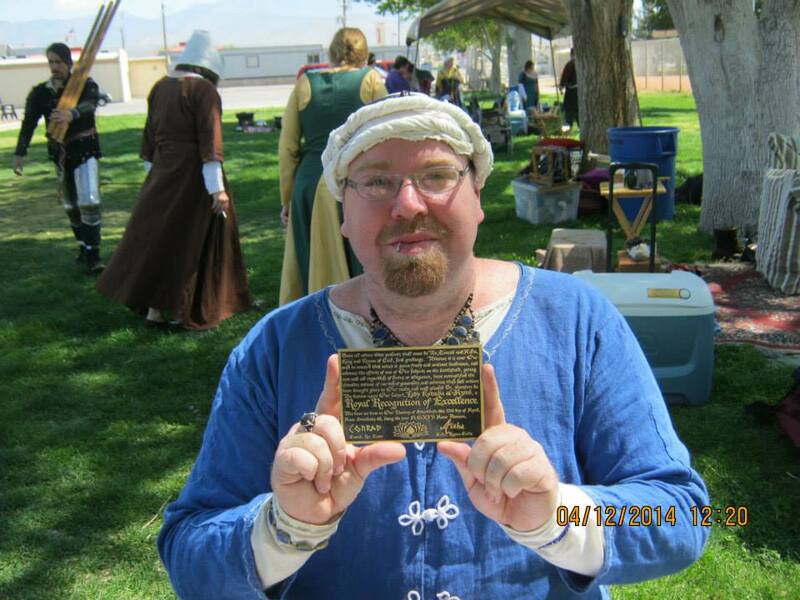 Their Majesties had seen some of my attempts at brass etching, and further discussion led to my offer to make the scroll for Lady Kutaiba. The Royal Recognition of Excellence does not normally receive a proper scroll, and the award certificate leaves a lot to be desired. 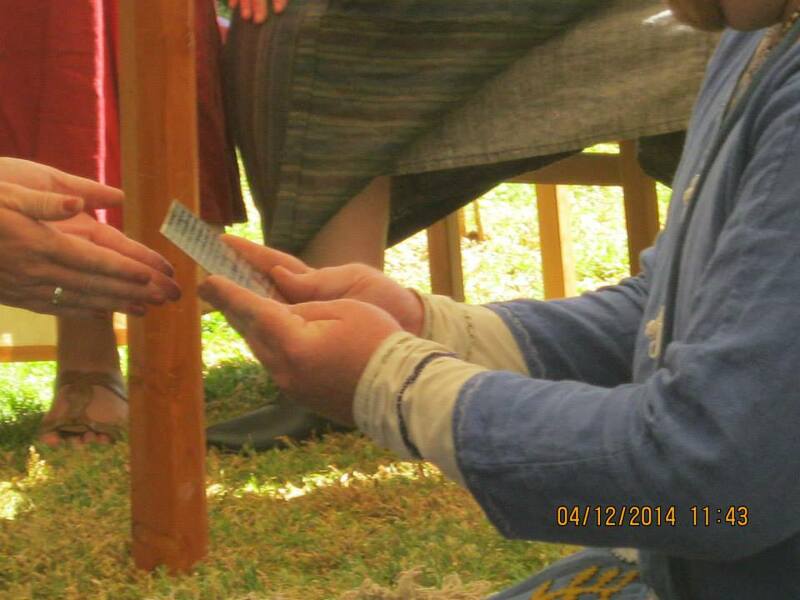 Their Majesties agreed, and so I set out to make the first brass-etched scroll in Caid’s history. Kutaiba al-Azrak, holding her scroll. Unto all whom these presents shall come do We, Conrad and A’isha, King and Queen of Caid, send greetings. Whereas it is ever Our wish to reward that which is given freely and without hindrance, and whereas the efforts of one of Our subjects on the battlefield, giving care and aid regardless of status or allegiance, have exemplified the chivalric virtues of courtesy & generosity, and whereas these said actions have brought glory to Our realm and well pleased Us, therefore do We bestow upon Our subject, Lady Kutaiba al-Azrak, a Royal Recognition of Excellence. I had Their Majesties approve the text, then created the artwork for etching in Photoshop, using the Xenippa font from Pia Frauss, and a lotus blossom (a motif from Lady Kutaiba’s heraldry). 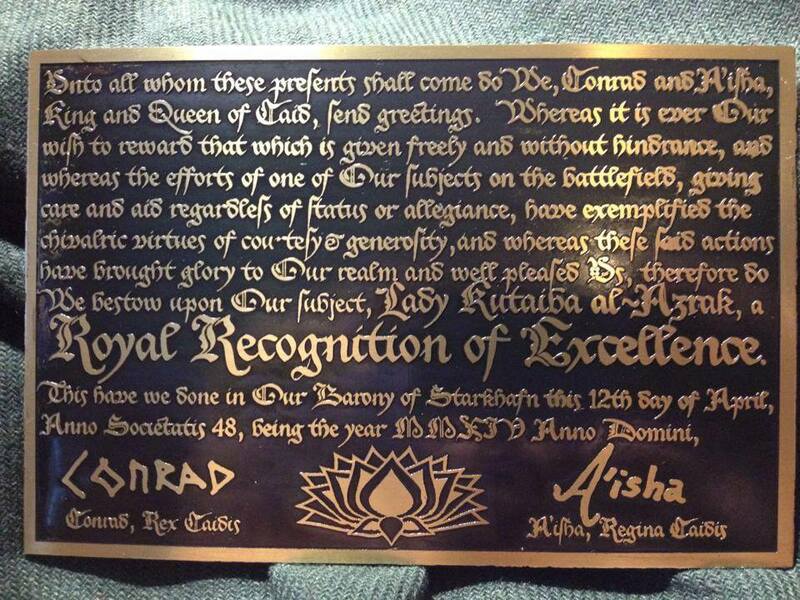 Finally, I applied the art to the brass, and had Their Majesties sign the plate in Sharpie prior to etching. Once etched, I used an industrial patina to tint the background, and sealed the piece with lacquer. Their Majesties presented the scroll to Lady Kutaiba during opening court at Starkhafn Anniversary. There were many tears, and she showed the plate to anyone and everyone who would stand still long enough for her to pull the plate from her pouch. So…I think she liked it.